The seat, once held by former prime minister Atal Bihari Vajpayee, remains a crucial and prestigious constituency for the BJP. Elections in Lucknow will be held in the fifth phase on May 6. Union Home Minister Rajnath Singh filed his nomination from Lucknow Lok Sabha seat on Tuesday, followed by a 5-km long road show from the city BJP office to district collectorate. Samajwadi Party sources suggested that Poonam Sinha, wife of rebel BJP MP Shatrughan Sinha, may contest against Singh in Lucknow. The seat, held by former prime minister late Atal Bihari Vajpayee for a long time, remains a crucial and prestigious constituency for the BJP. Elections in Lucknow will be held in the fifth phase on May 6. The results will be announced on May 23. Seeking his second term from Lucknow, Rajnath said that there is a widespread wave in favour of the BJP and claimed that the country is touching new heights under the leadership of Prime Minister Narendra Modi. Talking to party workers before the roadshow, he said that he recently visited 10 states and there is a similar excitement among the people for the BJP. 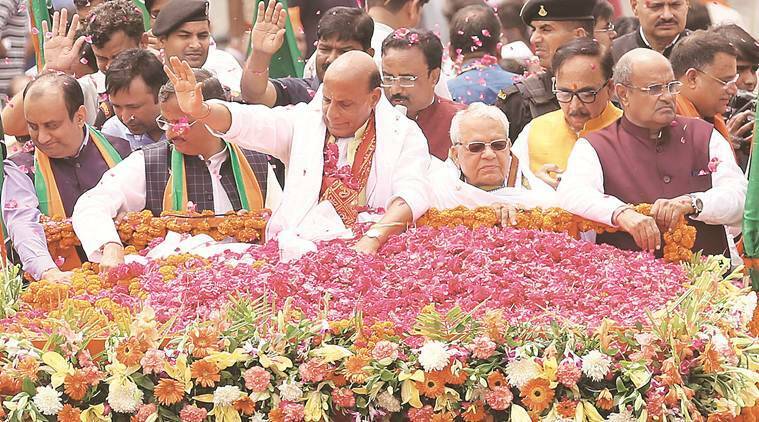 During his roadshow, Rajnath was accompanied by deputy chief ministers Keshav Prasad Maurya and Dinesh Sharma, senior party leader Kalraj Mishra and JDU national general secretary K C Tyagi among others. Rajnath’s supporters, waving flags of BJP and JDU, raised slogans of Jai Shri Ram and Rajnath Singh Zindabad. After the nomination, Rajnath thanked Lucknow for the support. “Thank you Lucknow! Your affection and energy in today’s roadshow was overwhelming and it would remain etched in my memory,” he tweeted. “Today I will file my nomination papers from Lucknow parliamentary constituency. I seek the support and blessings of the people to continue working for them and realise Shri Atalji’s dream of making Lucknow a world class city,” he said in an earlier tweet. Earlier in the day, Rajnath offered prayers at the Hanuman Setu temple before filing his nomination.